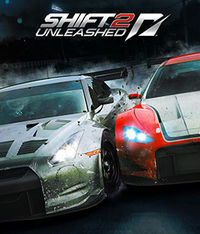 '''SHIFT 2 Unleashed''', also known as '''Need for Speed: SHIFT 2 Unleashed''' is the 17th instalment in the long-running [[Need for Speed]] series of racing games, developed by Slightly Mad Studios and published by [[Electronic Arts]]. It is the direct sequel to 2009's [[Need for Speed SHIFT]] and expands on the gameplay and features of the original. Some of the new features include night-time racing, a new helmet camera and the [[Autolog]], which was first introduced in [[Need for Speed Hot Pursuit 2010]]. A new elite handling model aimed at sim-racing enthusiasts is also available, while the physics engine and overall handling of the cars was improved, especially for racing wheels. In addition to this, SHIFT 2 Unleashed will also feature some of the cars and tracks of the 2010 FIA GT1 World Championship and 2010 FIA GT3 European Championship, among other racing content. The final game features 123 cars and 36 different tracks. Some of the new features include night-time racing, a new helmet camera and the [[Autolog]], which was first introduced in [[Need for Speed Hot Pursuit 2010]]. A new elite handling model aimed at sim-racing enthusiasts is also available, while the physics engine and overall handling of the cars was improved, especially for racing wheels. In addition to this, SHIFT 2 Unleashed will also feature some of the cars and tracks of the 2010 FIA GT1 World Championship and 2010 FIA GT3 European Championship, among other racing content. The final game features 123 cars and 36 different tracks (no DLC included). The game shipped in two editions, the normal one and a '''Limited Edition''', which comes with three aditional cars (Alfa Romeo Guilietta QV, Lamborghini Murciélago LP640 and Nissan Silvia spec.R Aero (S15)) and 37 additional events, which include Old vs. New matchups, Manufacturer Battles and Single Manufacturer races. SHIFT 2 Unleashed, also known as Need for Speed: SHIFT 2 Unleashed is the 17th instalment in the long-running Need for Speed series of racing games, developed by Slightly Mad Studios and published by Electronic Arts. It is the direct sequel to 2009's Need for Speed SHIFT and expands on the gameplay and features of the original. Some of the new features include night-time racing, a new helmet camera and the Autolog, which was first introduced in Need for Speed Hot Pursuit 2010. A new elite handling model aimed at sim-racing enthusiasts is also available, while the physics engine and overall handling of the cars was improved, especially for racing wheels. In addition to this, SHIFT 2 Unleashed will also feature some of the cars and tracks of the 2010 FIA GT1 World Championship and 2010 FIA GT3 European Championship, among other racing content. The final game features 123 cars and 36 different tracks (no DLC included). The game shipped in two editions, the normal one and a Limited Edition, which comes with three aditional cars (Alfa Romeo Guilietta QV, Lamborghini Murciélago LP640 and Nissan Silvia spec.R Aero (S15)) and 37 additional events, which include Old vs. New matchups, Manufacturer Battles and Single Manufacturer races. This March, get ready to push your driving skills to their ultimate nerve-wracking limits as SHIFT 2 UNLEASHED puts you behind the wheel of the only truly realistic and immersive racing game on the market. Intensely authentic physics and true-to-life degradation of cars and tracks, plus an eye-watering sense of speed combine with the all-new helmet camera to let you feel every scrape and impact in your all-out fight to the finish line. Your Driver's Battle doesn't end at the checkered flag though, as SHIFT 2 UNLEASHED features the advanced Autolog system that takes the action to a new level by letting you dynamically share and compare career stats, driver profiles, pictures, videos, and personal bests with your friends in real-time. Laptop versions of these chipsets may work but are not supported. Updates to your video and sound card drivers may be required.